Up until now, pirates in Flying Lab's MMO Pirates of the Burning Sea have gotten the short end of the stick. While the different nations had a choice of career paths, pirates were pirates, which works fine in PVE but in group PVP it led to an imbalance...everyone knows what they're up against when they're fighting pirates. Well not anymore. The upcoming 1.4 patch of the game is introducing two new pirate classes, separate factions in the Brethren of the Coast. 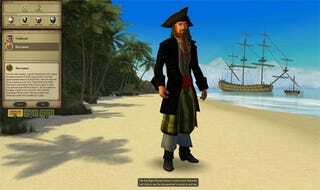 Existing pirates will be become Cutthroats, the more brutal type of pirates, while players creating new characters can opt between that or the new Buccaneer class. Buccaneers are pirates too, but a bit subtler than their burning-bearded brethren. They steal and loot, but also manipulate the black markets. Some would call them gentleman adventurers, though few are true blue bloods. Buccaneers do not have the raw power of cutthroats, but they work well in groups and can help friends and cripple enemies. Bah. Either way they're still pirates, and one ninja could easily take either out.